The ultrasound waves that are reflected will then return as “echoes” to the probe, and are converted into an image that is displayed on the monitor, giving a 2-dimensional “picture” of the tissues under examination. 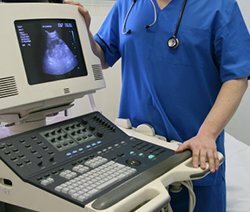 What types of diseases are diagnosed with an ultrasound examination? Some diseases can be diagnosed because they have a specific ultrasound appearance, while other conditions have non-specific ultrasound findings. The ultrasound examination permits a detailed view of many of the body’s organs, including the internal or inner structures of the kidneys, liver, and other abdominal organs, and allows the recognition of cysts and tumors. It is excellent for viewing the interior of hollow organs such as the bladder. 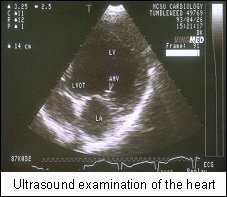 An ultrasound examination is especially helpful for diseases of the heart, and when used to examine the heart, the procedure is called echocardiography. The thickness of the heart walls, the size of the chambers, and the motion of the valves and other cardiac structures are all measured, allowing an assessment of the heart’s function and structure. This examination can help determine stages of heart disease, potential congenital or developmental abnormalities, and whether or not certain medications may be useful in improving a pet’s longevity and quality of life. Anesthesia is not usually needed for most ultrasound examinations, unless samples are to be taken. The technique is totally painless and most dogs will lie comfortably while the scan is being performed. Occasionally, if the dog is very frightened or fractious, a sedative may be necessary. Is it necessary to shave my dog’s fur? In most cases, the fur must be shaved to perform an ultrasound examination. Since ultrasound waves are not transmitted through air, it is imperative that the hand-held probe makes complete contact with the skin. In some cases, such as bladder evaluation or urine collection, it may be possible to get adequate images by moistening the hair with rubbing alcohol and applying a copious amount of water-soluble ultrasound gel. However, in all cases, the ultrasound images will be of better quality if the area to be examined is shaved. Although the initial cost of a scan may seem high, it has to be equated with the high cost of the equipment, the fact that specialized training is required in order to obtain and interpret the images, and a significant amount of time is involved in carrying out the examination. Its usefulness for evaluation of the internal organs and assessment of heart function make it an invaluable, non-invasive diagnostic tool to help protect to your pet’s well-being.